This is a 500 word story I submitted to ABC Open for their 500 words: Endings project . Now, even 20 years after the event I still feel the connection as if it was only yesterday. Three weekends without a single response to my advertisement. But this morning, several phone calls before 8 o’clock have me scrambling to schedule their arrivals to allow time for an inspection and haggling, though I am fairly sure I will get my price. She looks good in the sunlight. Her colour suites her and it was that colour that had attracted me to her in the first place. No discrimination here. The first caller turns up dead on time and walks around her, taking note of her lines, the signs of aging that all old girls get after years of faithful service. Even a few small hints of cancer. I tell him of her faithfulness, of my unwavering trust in her, of her service…. He offers me a price lower than I want, so I say no, that I have three others coming this morning and I am confident I will get my price. As if arranged, the second buyer turns up, early by happen chance, and with a look of surprise the first guy quickly agrees to my price. Guy two is not impressed. Crisp one hundred dollar bills are counted into my hand and the paperwork duly completed it was with a rising tide of emotion and a tightening chest I watch her as she leaves in a trail of dust as if trying to leave a filament of existence, never to return. I feel abandoned, naked, as I stand there alone. Gone is my last emblem of freedom, my symbol of a life past, a joint history of adventure, drama and fun. She signified footloose and unrestricted exploration through some of the wildest parts of western and northern Australia bounded by neither time nor obligation. 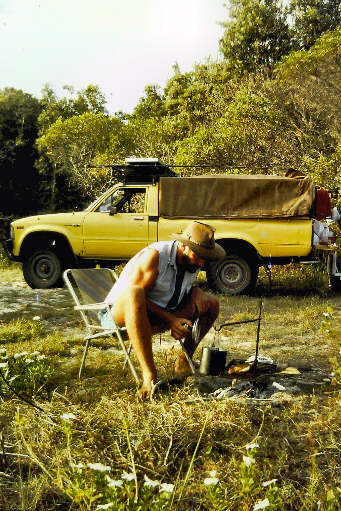 Together we had been bogged to the axles in the soft sand of Cape Arid, gotten wet together as we forded the mighty rivers of the Kimberly, rattled across corrugations as big as the most severe shopping centre speed bumps till my fillings threatened to fall out and she suffered stress fractures. She had sheltered me during a mini cyclone and I pulled her out (with a little help) when she got stuck in the mud. She was my symbol of all that and more, an icon of the traveling adventurer that I had clung to. In a way she had helped ward off the haunting memories of those days of driving, camping, fishing and fun. Those invasive recollections of a year of endless summer were tempered only by the reassurance that she was still there, that I could go whenever I wanted. Together we could again and wend our way through the tracks of near and far. Not now, she is gone. But life has many different tracks and here I was on a new one, a life where a two seat 4WD Hilux ute has no place in my new urban world of 9-5, car capsules and nappies. Farewell my old yellow ‘truck’ with your tired canvas canopy that once sheltered all my possessions. Serve another well as you served me, and thanks for the memories. Enjoy this story. Feel free to leave a response.